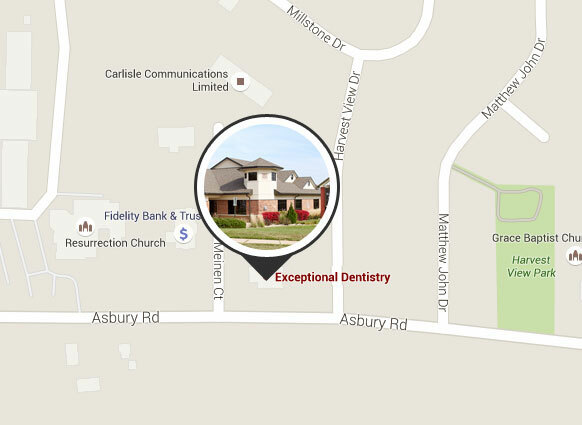 At Exceptional Dentistry, we are committed to remaining at the forefront of the cosmetic dentistry profession. Dr. Ted Murray’s dedication to your dental health is evident in his comprehensive education and his advanced training and teaching. Dr. Kristen Berning brings a modern approach to treating young children and teens and sharing the latest in advanced techniques. Dr. Alexia Oetken also utilizies advanced technology through her commitment to continous eduation. Our professional team is up-to-the-minute in knowledge and training, participating in ongoing education courses along with our dentists. To ensure your comfort and safety, we invest in the very latest technology. Digital photographs are useful for recording facial measurements and dental issues during a comprehensive dental health assessment. Digital photographs are also used to record "Before and After" pictures for your records, and perhaps also to help other patients review the results of specific procedures. These photographs are also a critical part of the clinical record, and many times are needed for the dental insurance company. Digital X-rays eliminate up to 90% of radiation you would be exposed to with conventional X-rays. The images are immediately available for study, so our dentists can explain what is happening in your mouth. Digital radigraphs are one of the ways Exceptional Dentistry can continue our commitment to your health and safety. DIAGNOdent is cutting-edge technology that uses a laser to detect hidden or early areas of tooth decay. It has revolutionized a dentist’s ability to find and treat cavities before they require more extensive treatment. Whatever dental treatment you're considering, clear images of your teeth, gums and jaw are crucial if you are to get a sound diagnosis and treatment recommendation. That's why we use the i-Cat 3D Cone Beam Digital Imaging System. It provides our dentists with 3D images of your mouth, allowing us to gain crucial insight into your dental health. A typical scan takes just eight seconds. The K7 is a highly accurate diagnostic device that effectively measures and records symptoms of temporomandibular joint disorder (TMJ). The K7 evaluates your bite, your temporomandibular joint (TMJ), your jaw muscles, and determines your relaxed jaw position, which gives a starting point for treatment. The TENS unit gently stimulates muscle activity using low frequency electrical pulses. A session of 30 to 40 minutes will completely relax muscles that may have been tense for years. It is used in treating TMJ disorder. This very advanced laser gently sculpts gums and other soft tissue to achieve a more balanced and harmonious smile line. Its mild heat vaporizes small amounts of tissue, sealing the area to prevent bleeding. This gives a shorter recovery time and optimal results. The laser is also used to perform frenectomies, when the lingual frenum or maxillary labial frenum is too short, tight, and restrictive. Fast, affordable, long-lasting tooth whitening six or eight shades brighter is available in-office with the Zoom! 2 Teeth Whitening system. Teeth are whitened in usually just one office visit. To keep your brightened smile looking great, a custom-fitted pair of bleaching trays and highly effective peroxide gel can be used at home whenever you feel your smile needs a boost. No matter what your smile needs may be, Exceptional Dentistry has the tools, techniques, procedures and dedicated team to create the results you want. Please email our friendly office today or call 563-556-2711 to schedule your initial consultation. We serve Dubuque, Cedar Rapids and Davenport, Iowa.